Most of the time when you think of zombies, you think of maybe some voodoo curse, or a necromancer run amok, or maybe some sort of terrible disease. 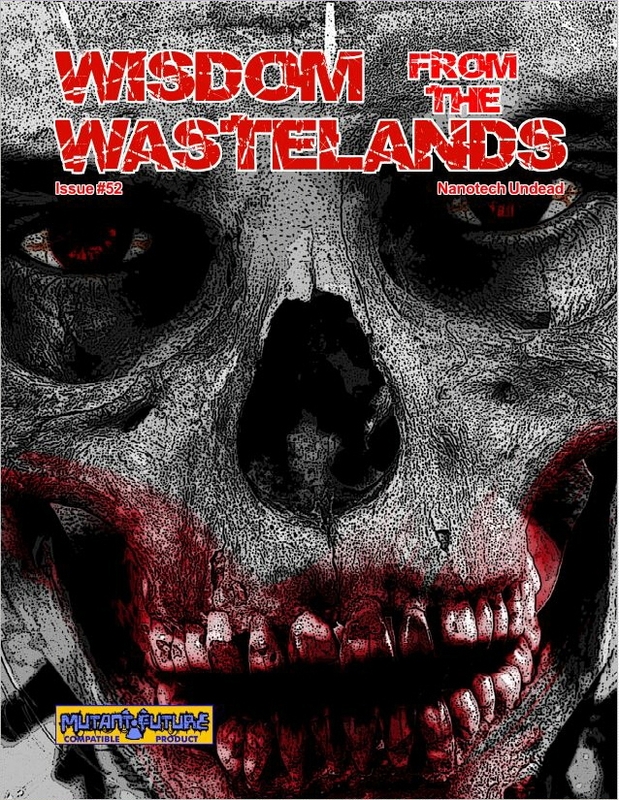 The latest issue of Wisdom from the Wastelands takes a slightly different look at the walking undead. The zombies (and other such undead horrors that inhabit the world) here were purposefully-designed weapons. They're basically cyberzombies, having been made by mad scientists who grafted technology to corpses to be used in a long-forgotten conflict. Unfortunately, the weapons are still out there, roaming around, not realizing the war they fought in was finished long before. Inside this issue, you'll get the stats and descriptions for 25 different cyberzombies. This includes information about the monster's general traits, their tactics, where you can find them, and such like that. There's also rules for a zombie disease, including it's transmission, incubation time, and possible treatments for it. You can download yourself a copy now.